SmartBro, A Pre-Paid Balance Personal Assistant App That Everyone Should Try! One of the biggest issues faced by Pre-paid users in India is, majority of them never understand how their prepaid balance evaporates so fast. With 95 percent of Indian mobile users being on pre-paid, this is a problem faced by potentially hundreds of million of users. (Note:India crossed 1 Billion mobile user mark in October 2015). 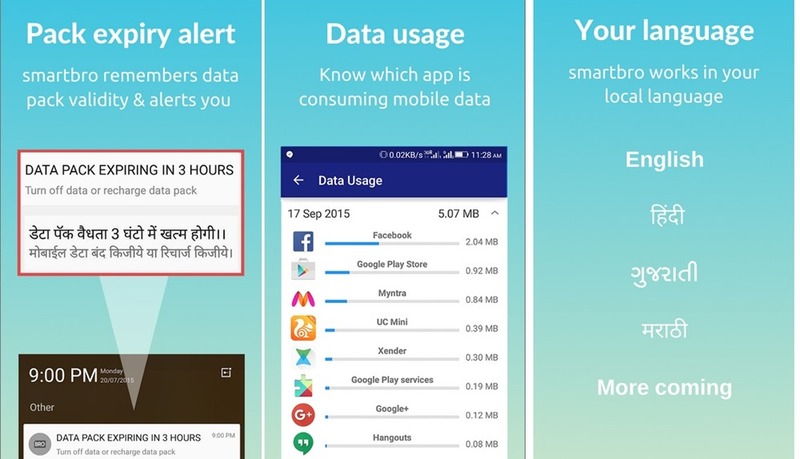 Pune based startup, Optinno Mobitech Pvt Ltd, who had earlier developer SMS blocker App have now come out with a new Android based smart personal assistant app- SmartBro – that removes all ambiguities and hassles in understanding how telecom operators bill pre-paid users. Telecom operators are notorious for sending ambiguous and inconsistent information (regarding prepaid balance) to their users. Also, prepaid users do not have luxury of having a consolidated bill, like postpaid users. So, they never understand how much their voice calls or mobile data usage have cost. Mobile users who do not understand English have even bigger problems, as messages (or pop-ups) sent by Operators make no sense to them. While Operators provide USSD based codes to check remaining balance or pack details, it is quite cumbersome for most users to do it constantly. The app, with use of operator popups, SMSes and its own data analytics engine, is able to figure out correct details regarding talktime balance, cost of each voice call or mobile data session and automatically shows it on the dialer, before making a call. This helps people to get an idea on how much balance is left and the users can make calls accordingly. 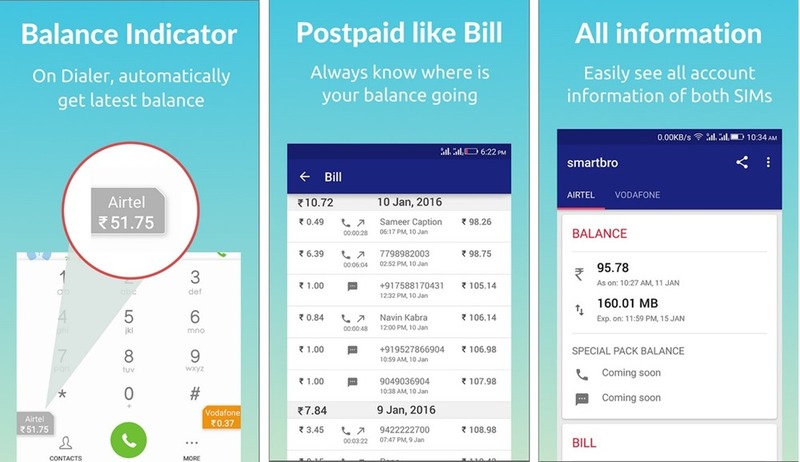 SmartBro creates a real time bill of all the calls and consolidates it on one single screen to give user a complete view of how their prepaid balance has been used. This empowers users to keep control on their balance spend and know exactly where the money is going. Apart from this, the app also has various features including support for local languages like Hindi, Marathi & Gujarati, enabling non English users to understand their balance expenses. It supports dual-SIM phones too where it shows balance and other details for both the SIMs on users’ phone. SmartBro was developed over a period of 1.5 years by a 4 member team headed by Founder and CEO Sagar Bedmutha. The app was launched 3 weeks back and is now live on Google Playstore. If you are a pre-paid user, give SmartBro a try and let us know your feedback! "SmartBro, A Pre-Paid Balance Personal Assistant App That Everyone Should Try! ", 4 out of 5 based on 11 ratings. Reliance Jio LYF 4G Smartphones Available via Grofers; Moto X Force Spotted on Amazon India Before Launch! Myntra Plans US Expansion, Sets Up Myntra Inc Subsidiary! Looks like a great idea and app. Trying it for sure. Will be back with review.